Recorded in a surprising number of different spellings as shown below, this is a medieval surname of French origins. It is a status and occupational surname which originally described a skilled stone mason, one who had served his time as an apprentice to a master craftsman. The derivation is from the pre 8th century Old French word "masson", probably introduced into England by the Norman-French after the conquest of 1066. Indeed before that time few places in Britain were built in stone, so the French largely introduced both the word and the skill. The surname is one of the earliest recorded and early examples include: John Macun in the building accounts of King Henry 1st of England in the year 1130, and Ace le Mazun, in the Pipe Rolls of Lincolnshire in 1193. 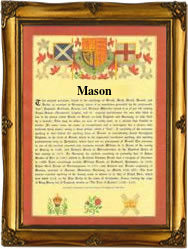 Spellings of the surname both in Britain and France include Macon, Mason, Massen, Masson, Machen, Machent, Machin, and Machon. Early examples from surviving church registers are those of Elizabeth Masson christened at St. Margaret's Westminster, on July 21st 1540, and Awdry Mason who married William Elyat at that same church on June 10th 1548. Among the many prominent figures with this surname was George Mason (1725 - 1792), the American statesman who framed the Virginia Bill of Rights. This was later was used as a model by Thomas Jefferson when he drafted the Declaration of Independence in 1776. The first recorded spelling of the family name is possibly that of Richard Machun. This was dated about the year 1120, in charters of the Danelaw, for the county of Lincolnshire, during the reign of King Henry 1st, known as "The Lion of Justice", 1100 - 1135. Throughout the centuries, surnames in every country have continued to "develop" often leading to astonishing variants of the original spelling.